Bikes belong in the street, not on the sidewalk. In fact, it is illegal for anyone over the age of 12 to ride on a sidewalk in Chicago*. 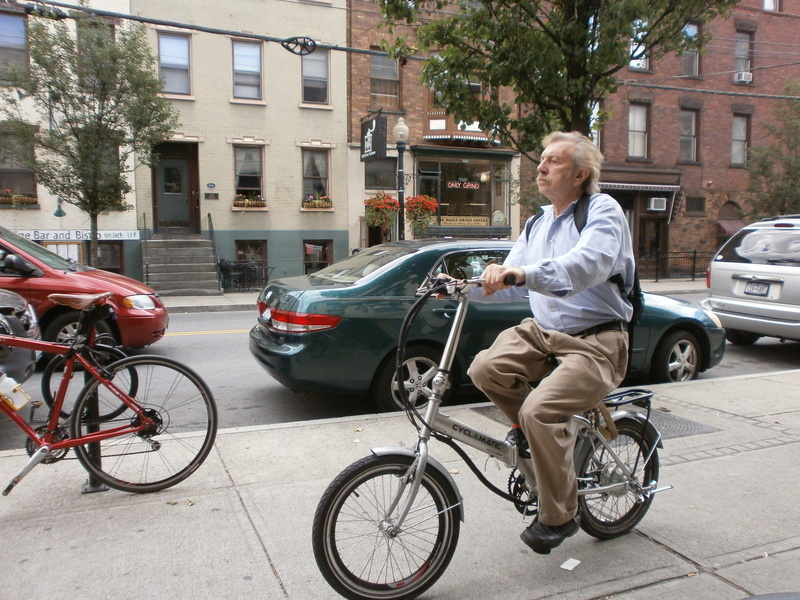 Riding in the street is generally safer because you are visible, while on the sidewalks you encounter pedestrians, cross streets, alleys, and parking lot entrances where drivers don’t expect to see bikes. 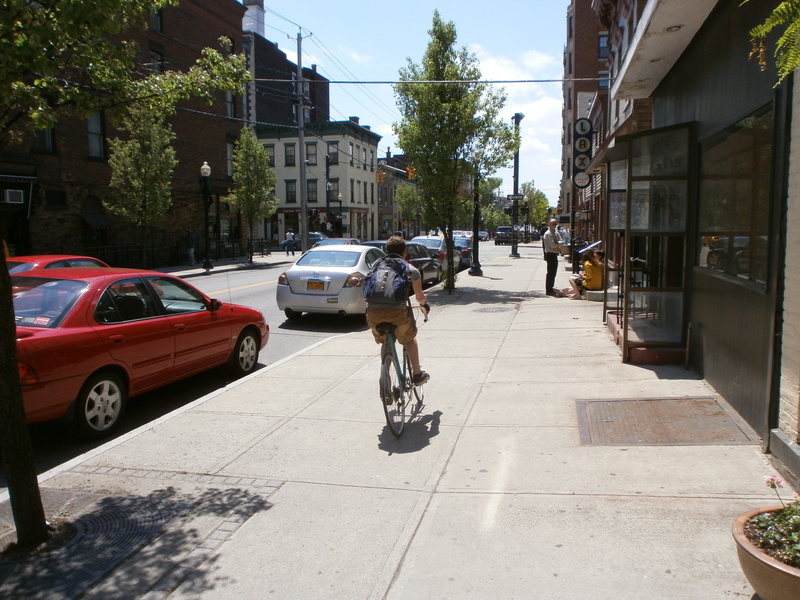 Riding in the street is also generally faster and smoother, on better-maintained pavement instead of concrete blocks. Finally, riding in the street sends the correct message to drivers: that bikes belong. Despite all of this, sometimes I take the sidewalk. Very rarely and only on the arterial streets when there is no way around them. This is the type of Chicago street where you’ll find the Targets and the McDonalds. Four lanes, two in each direction, no shoulder, definitely no bike lane, high speeds, and ginormous potholes. Meanwhile, the pedestrian-free sidewalks beckon. For these reasons, if I absolutely cannot avoid taking these streets, I usually ride on their sidewalks. The most recent sidewalk expedition was on Thursday night, as my destination was on an arterial street and it’s the only way to get across the highway and river dividing the east and west sides. On top of everything, it was dark and raining. After studying Google maps in preparation for the trip, I decided that I would take side streets as far as possible and then hop on the sidewalk. Watch out for pedestrians and either slow to a crawl or walk your bike past them (if a sidewalk has a lot of pedestrians, don’t even try riding your bike on it). Keep an eye out for alleys, driveways, parking lots or any other place from which a car could spring. Be extra cautious and look both ways. At cross streets try to cross with the light in the cross walk. Assume that drivers do not see you. They certainly don’t expect anything faster than a pedestrian. Look over your shoulder for turning traffic. This particular ride was more stressful and took longer than normal rides in the street because I had to slow and stop at so many intersections. Although I passed no pedestrians, I passed a few bikes – a couple on the sidewalk and a couple in the street. Did I feel a little sheepish when I passed the street riders? Sure, but not sheepish enough to throw myself in a situation where I did not feel safe. The problem is that the city traffic design completely disregards bikes at the most dangerous areas, such as crossing rivers and highways. (Read about this problem in more detail at Chicago Bike Blog, where the author eventually decides to take arterial street sidewalks for a particular route with her son). So for those who are passionately against sidewalk riding under any circumstances, I respect that, but don’t hate the player, hate the game. *NOTES: New York State appears to be typical in that the Vehicle and Traffic Law 5 does not regulate sidewalk bicycling. It appears that the General Municipal Law (Section 180) 6 states that NY municipalities can regulate bike riding on sidewalks. They cannot require that bicyclists use a sidewalk instead of a public roadway, but they can impose limits to sidewalk bicycling. ALBANY CODE – § 359-4 Riding on sidewalks prohibited; exceptions. – No person shall ride any bicycle, tricycle, velocipede or other vehicle of propulsion on or over any footpath in any of the parks, or on or over any of the sidewalks of any of the streets or avenues in this City, except if it is to go into a yard, lot or building; provided, however, that the foregoing provision of this section shall not apply to children under 10 years of age; and provided further that this section shall not be so construed as to prohibit the riding of any bicycle, tricycle or similar vehicle upon or over the unpaved portion of the sidewalk of any such street or streets outside of the thickly settled part of the City as shall be designated in writing by the Mayor. Every designation so made as aforesaid shall be filed with the Chief of Police and may be revoked by the Mayor at any time in his discretion.